While I was eating my breakfast, I thought Miles was just batting at one of the low-hanging ornaments. I went over to move some things that were dangling off the bottom branches, only to discover that the tree’s movement was actually the cat climbing into the tree. I pulled him out, but of course he climbed right back up. I left him there, partly because I had to go and partly because I realized that it didn’t really matter what I did, he was going to do whatever he darn well pleased. By the time I got to school, I had started to worry that he was going to topple the tree over. I said this to someone and they thought I meant that I was worried that he was going to get hurt. Ha. I was fearful for my fragile ornaments! I felt a little foolish running home right away just to check on it, but he was right. I would have sat all morning wondering if everyone and everything was safe. Luckily for the cat’s continued existence, the tree was (and is…) still standing. Hopefully in a few days, the novelty will wear off. He is endlessly entertaining, at least. We always had a hook in the wall behind the tree (anchored into a stud) and tied the tree to it. Made for less stressful holidays from the perspective of small kiddos and the kitties. Can’t beat the free entertainment those kitties provide! I made the realization after watching our kitten be particularly frisky and naughty that we haven’t even put the tree up yet and dear me what is he going to do with it. But now you are telling me that not putting ornaments at the bottom is going to be enough but that he will try to climb the darned thing?!?!!? It’s wise to anchor the tree to the wall. We have 2 cats and the first year they destroyed our artificial tree. Last year we got a “real” tree, and they toppled it over the first night. So we anchored the tree to a corner and we all lived happily ever after. But I would protect and take off those ornaments you cherish. They are just there to play! Good luck! My sister fosters cats and kittens to get them ready for forever homes. No tree for her this year. Busy, busy kitties. My Molly sleeps under our tree. It’s warm and toasty. My 2 don’t bother the ornaments. The novelty will wear off. Enjoy him while he’s still kittenish. Great pic! 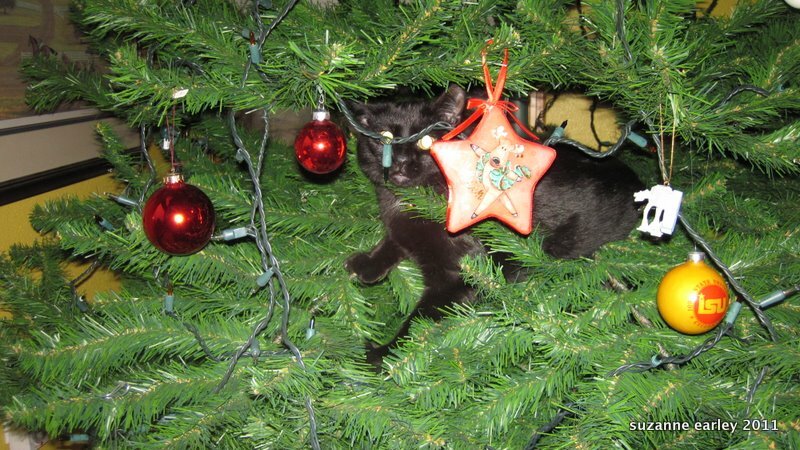 Our last cat had a thing for drinking the tree water…thankfully, she was not interested in climbing it!